"Lean finely textured beef," aka "pink slime," sparked an uproar when the USDA bought 7 million pounds of the stuff for school lunches. 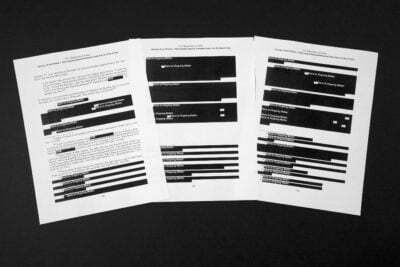 The agency maintains it's safe and healthy; critics say it's not fit to eat. 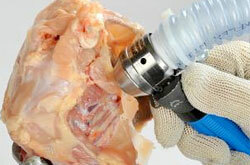 But the burger filler isn't new, nor is it the only way that meat packers maximize production. Here's how it stacks up against two other mechanical processes. 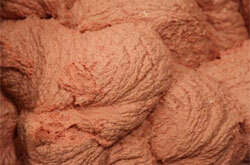 "Pink slime," coined by former USDA microbiologist Gerald Zirnstein in 2002. "White slime," in the popular press. Processed beef trimmings and recovered materials from meat carcasses, like fat and connective tissue. 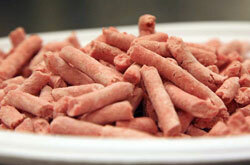 A "paste-like and batter-like meat product" made from mechanically removing meat from animal bones. Pieces of meat that have been scraped, shaved, or pressed off the bone by special machinery. Trimmings are heated to 100°F and spun inside a centrifuge to separate the meat from the fat. After the fat is removed, the remaining beef bits are treated with ammonia hydroxide to kill bacteria such as E. coli or salmonella. They are then ground up, frozen into blocks and added to other beef products. Carcasses are forced through "a sieve or similar device under high pressure to separate bone from the edible tissue." The remaining fragments (the USDA limits how many bits of bone are acceptable) are ground up into a paste and added to other processed meats. Without grinding, crushing or pulverizing the bone itself, a machine removes edible tissue from beef and pork bones. If the resulting bits have more than 150 mg of calcium per 100 grams (indicating the presence of bones) they must be labeled "mechanically separated" meat. Some companies may soon include "lean finely textured beef" on their product labels, and Congress recently introduced a bill to require labeling. Right now the USDA does not require any disclosure, because the product is considered the same as beef. Manufacturers must always label "mechanically separated" pork, chicken or turkey on the ingredients list. According to the American Meat Institute, the product is no longer typically used in chicken nuggets (McDonald's has repeatedly claimed that its chicken nuggets only contain chicken breast meat). Is labeled the same way as any other meat – such as "beef" or "ground pork." Trimmings are typically collected from more bacteria-prone parts of the cow, but treatment with ammonia is supposed to kill pathogens. In 2009 some beef products tested positive for E. coli and salmonella, but the USDA says it has modified inspection processes since then to address safety concerns. The USDA continues to "affirm the safety of Lean Finely Textured Beef product for all consumers." Mechanically separated beef was prohibited for use as human food in 2004 due to concerns that spinal tissue (potentially carrying mad cow disease) could get mixed into the meat. Mechanically separated poultry and pork are still allowed. The USDA requires that the spinal cord be removed before processing the neck bones and backbones, so that pieces do not get mixed into the meat.